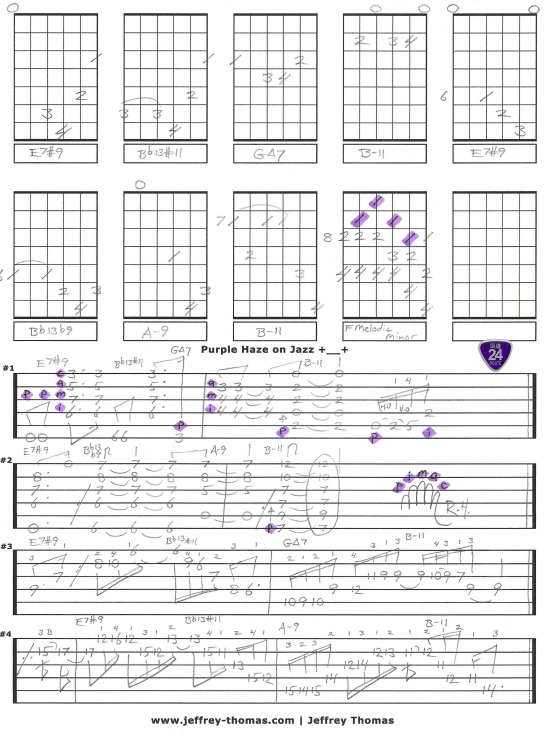 Free Purple Haze guitar lesson with tab and video. This Jimi Hendrix guitar lesson should be of interest to any Jazz or Hendrix fan. Jimi was one of the first guitarists that fascinated me when I started playing. As I started to study jazz guitarists, jazz theory etc…I would sometimes wonder what Jimi would play like if he were still around and what Purple Haze would sound like with modern jazz concepts applied to it. I have written out 2 reharminizations for the verse of Purple Haze and 2 single note examples following the new harmony using a alternate E7#9 chord voicing and adding the Flat 5 Substitution of Bb13#11 with added G Major 7, B Minor 11, A Minor 9th voicings and the F Melodic Minor Scale over E7. Want the guitar tab for free? Just send in your email address using the form provided. Looking for online jazz guitar lessons? Fill out the Schedule A Free Lesson form to set up your free Skype guitar lesson today! Many modern jazz fusion guitarists have taken a Hendrix style approach with their tone and technique. Check out my online video guitar archives for more cool, unique lessons and tunes.